Did you know that there can be massive amounts of highly toxic pesticides used in the shipping containers, especially when products and materials are shipped over seas? In a world where recycling is being encouraged, this presents some potentially serious problems that aren’t being widely discussed. Some things have simply not been designed to be reused, and recycling toxic materials just spreads the contamination further afield, causing low level poisoning and some kinds of chronic health problems. The trend to build all kinds of indoor furniture and garden beds out of pallets is quite troubling. 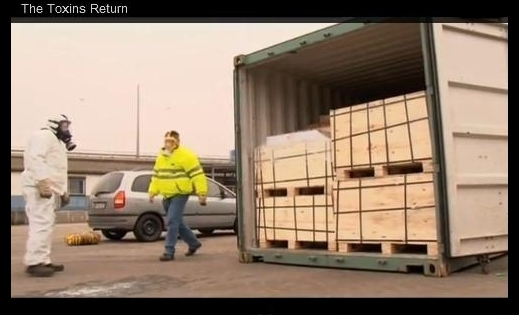 The pallets used in these containers would also have absorbed the pesticides and be unsafe for re-use. This article describes other issues with pallets. Converting shipping containers into homes is another big trend (see below). The following documentary depicts some serious problems related to clothing (as well as some other items that were shipped long distances) when saturated with health harming levels of pesticides. Manufacturing issues are also examined in this video.